The Austin Motor Co., in common with other pre-war manufacturers, supplied tools with every new car with the smaller items contained in a roll. Very few rolls will have survived, having been well used by the car’s early owners, or removed from the car to the household garage, never to be re-united. It is not an item which is mentioned in any of the books about the Austin Seven. 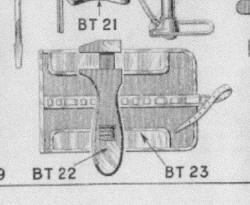 The only reference to a tool roll seems to be the ‘Austin Seven Spare Parts Lists for the Tourer C Pram Hood, Publication No: 353h’, where a small diagram, Item BT 23, is shown on page 60, and for the Tourer AD, Publication No: 353k, page 66. It is completely out of scale but may be useful as a start for rolls supplied in the late 1920s. Having inherited a 1938 Big Seven, which has been in the family since 1947, the original roll and tools have remained with the car. The roll has seen better days and has not been used for many years, but for originality it would be good to display the tools as they were when supplied with the car. One retailer sells a roll ‘from 1934 onwards’ but we decided to make one. The original material appears to be Rexine, probably not the strongest, or long-lasting, material to use and is no longer available, the equivalent now being Vinide leather cloth. The roll does not appear to have been made professionally but rather looking as though it was made as a cottage industry. 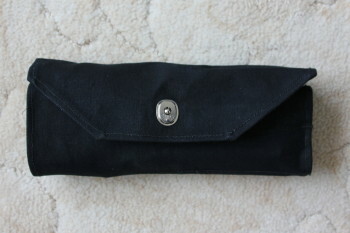 A new roll can be made using a domestic sewing machine by anyone with a little competence. We chose waterproof canvas, 300gsm, as the material for which a heavy duty denim needle is required. A piece 1.0m x 90cm width is sufficient to make two rolls laying the patterns with the grain in the same direction. Purchased through the usual online markets. The roll is fastened by a ‘Lift the Dot’ fastener which is fixed with a special tool costing around £80 so either borrow one or work out another method of making the required holes. 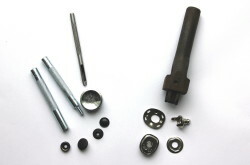 The fastener measures 22mm x 19mm, is in two parts and can be obtained from car trimming suppliers. The pocket has a ½” (12.5mm) black matte heavy duty stud fastener that also requires the use of a special tool but this can be bought with the fastener. Purchased through the usual online markets. Fabric glue is also recommended when making the hems. Polyester strong thread, or top-stitching thread, and a fabric marking pencil are also required. Careful measurement allowed us to prepare the pattern for the four parts of the roll. Plan 1 shows the overall dimensions. For the main piece (A) allow ¾” all round for the outer hem. 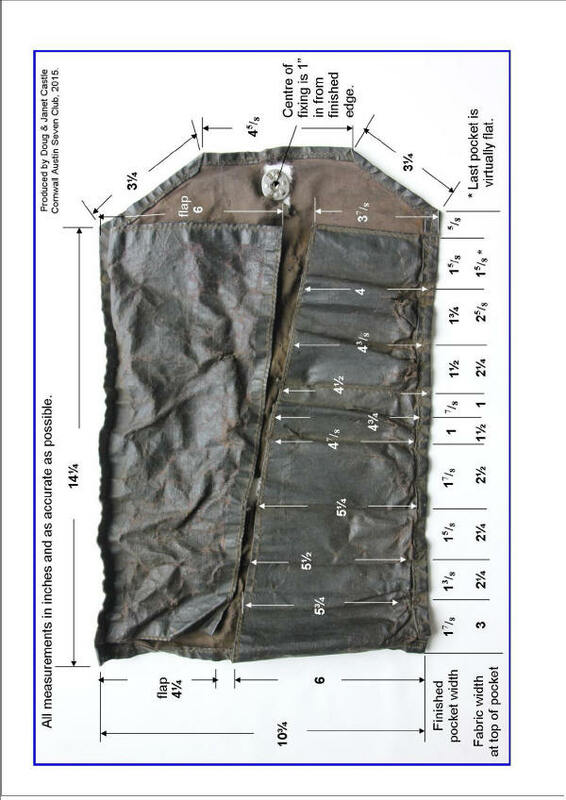 Allow ¾” all round the two pieces which make up the top flap (B)” and compartments (C), noting that during construction of the roll the straight outer edge will be trimmed. A 3/8” single fold hem only is necessary for the small pocket (D). Plans 2 & 3 show the dimensions for the pocket and position on the roll. This piece requires a minimum 3/8” all round for the single fold hem. 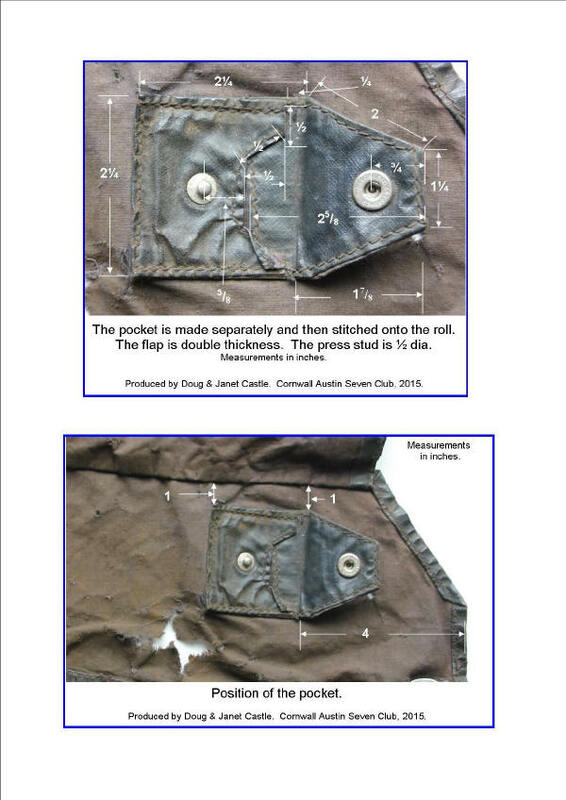 Note that the flap of the pocket is doubled over. If choosing to use canvas it is advisable to soak it first to lose the stiffness. Prepare paper patterns for each of the four pieces. For the main piece allow ¾” all round for the outer hem. Allow ¾” all round the two pieces which make up the “flaps” and compartments, noting that during construction of the roll the straight outer edge will be trimmed. A 3/8” single fold hem only is necessary for the small pocket. Mark the finished positions of B and C on A with a fabric pencil. Mark the positions of the compartments on C and A. Suggestion: Apply a light application of fabric glue to each hem as it is made and allow to dry thoroughly before stitching. A warm iron, using a cloth, and then clothes pegs were used to secure the hems whilst drying. Stitch a single folded hem on the short sides and top of C.
Stitch a single folded hem on the three sides of B.
Stitch the C to A with parallel stitching, matching the compartment lines previously. The stitching should finish ½” before the edge of A, and C will subsequently be trimmed but do not trim A. Match up B with A, taking care to align the centre edges of B with the position previously drawn. Glue and stitch a double folded outer hem on the inside of the main piece, the hem will fold over the edge on C ¼” over the bottom of the compartments, thus forming the bottom pockets. Form the pocket D with a single folded hem all round. Then attach both parts of the heavy duty stud before stitching the fabric to form the pocket. Use fabric glue between the pocket and the main piece before stitching these two pieces together. Allow fabric glue to cure over 4 or 5 days. Finally fit the ‘Lift the Dot’ fastener clasp, with the dot nearest to the outside hem, using the special tool, then put tools into the compartments and roll to decide the position of the stud for the fastener and fit. With tools in place the stud came at the centre of the 3rd compartment from the left. This article was written by Doug & Janet Castle for the CA7C website, August 2015.